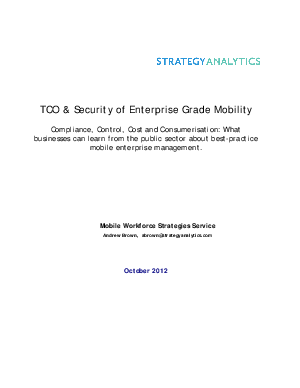 In this whitepaper, Strategy Analytics present the findings of extensive research into the total cost of ownership (TCO) and security for the major mobile platforms, including Apple iOS, Google Android™, BlackBerry®, Windows Phone and Nokia Symbian. Find out about the specific challenges that companies are encountering in the face of the four Cs: Compliance, Control, Cost and Consumerization. And, learn what businesses can glean from the public sector about best-practice Enterprise Mobility Management (EMM).